Perhaps one of the, if not the most gifted athletes and most intimidating competitors ever to wear the Hawk football, basketball and baseball uniform. 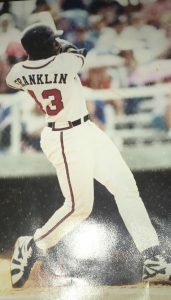 The soft-spoken Franklin was a fourth round draft pick by the Atlanta Braves in 1993. 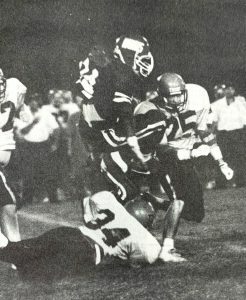 From Gary Canter – While the Nike world may have had their star athlete in Bo Jackson, LaRue County had its version in James “Bo” Franklin. When I think of the top athletes that I have had the pleasure of coaching, James certainly comes to the top of the list. While I only coached “Bo” in football, he also excelled in basketball and baseball. From Travis Wootton – I met James when he was a sophomore in high school (he looked like a grown man even then). His first football game he had something like 15 carries for 125 yards, and the legend of Bo began. By his junior year there wasn’t much he didn’t excel at. 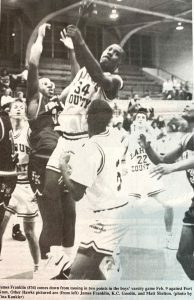 He was the best player on the best football team at LC (1991 when they went to the final four of the state tournament), he scored 1000 points in his weakest sport- basketball, and he is obviously best known for what he became on the baseball field. When you get drafted in the fourth round out of high school it’s pretty impressive. James was a very humble, almost shy person. James is also known for how well he can sing and play the piano. A lot of people probably do not know that. James is very deserving to be in the first HOF class. There is arguably not a better athlete to ever do it at LCHS than Bo Franklin. From Andy Meredith – James was the rare combination of size strength and speed. I honestly think that he ever knew how gifted he was. He was the kid that was fast enough…. his speed wasn’t best measured by a stop watch but better by he was fast enough to make the play. His strides were so graceful and LONG that he never looked like he was going that fast but no one could ever catch him with a football. They would almost always misjudge the appropriate angle … and the reason was he could always give it a little more gas. If he had a mean bone in his body he might have played on Sundays. And he never played organized football until his sophomore year. He came out to the first summer football practice and Coach Newton ran us to death to weed some kids out. Second day of practice James didn’t show up. On the third day of practice Jamie Curle and I went to his house to pick him up, and made him go. He never missed again. We talked James into playing baseball his sophomore year. He had never played organized baseball in his life. He actually, had never hit a baseball. Everyone knew how good of a softball player he was because he played for his older brother’s men’s softball team as a fourteen-year old. Newton coached baseball too, and he knew he could teach him a baseball swing. James would strike out his first seventeen at bats. He might have mixed in a walk or two but he physically didn’t hit the baseball till about ten games into the season. Newton stuck with him as many would question his ability to hit a baseball. At the start of district play a light bulb went off and he finally started to barrel-up almost every ball. I can remember he batted over .500 in tournament play that sophomore year. No one could get him out. And no one could get a fastball by him. He had the quickest bat and strongest hands that I had ever seen. He could almost swing a baseball bat backwards faster than anyone else on our team could swing normally. I always batted behind him so we always stood on deck together and to this day I can hear his bat in the warmup circle…. cutting the wind BOTH ways.